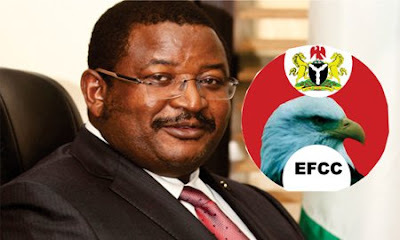 The Economic and Financial Crimes Commission, EFCC, Tuesday, narrated before the Federal High Court in Abuja, how an iron-bender in Kaduna State helped it to gain access into the house where former Group Managing Director of the Nigerian National Petroleum Corporation, NNPC, Mr. Andrew Yakubu, allegedly stashed about N3billion in a fire-proof-safe. An investigative officer at the EFCC zonal office in Kano State, Mr. Tasiu Abubakar, who testified as the first prosecution witness, PW-1, told the court that he was a brother to the ex-NNPC boss, Mr. Bitrus Yakubu, that led the agency to the safe. Abubakar also told the court that it was Bitrus that equally brought the iron-bender that helped operatives that went to search the House situated at Sabon Tasha, Kaduna State to break the door. He said the operation followed an intelligence information which leaked that a huge sum of money was hidden in the house. The witness said: “The zonal office has a unit called Intelligence & Special Operations Section known as ISOS, which its function is to carry out such investigation. Based on that, the zonal head of operation directed the unit to proceed to Kaduna and carry out surveillance. “Immediately on arrival, the said house was identified. A search warrant was obtained which the team executed on February 3. The house caretaker came and identified himself as Mr. Bitrus Yakubu. He told us that he is a brother to the defendant. “As a usual procedure, we asked him to search us. When we demanded for key to the apartment, he told us that he does not have it. He called one iron-bender who came with breaking tools to help us open the door”. “While the main door was unlocked, we entered along with Bitrus and the iron-bender. We further discovered another door inside which we also unlocked with the iron-bender. “Immediately the doors opened, we discovered a grey coloured Bubabi four-panelled fire-proof safe. We asked Mr. Bitrus the owner of the safe and he said it belongs to his brother, Engr. Andrew Yakubu. “We moved the safe outside the apartment along with Bitrus and further searched the apartment and discovered a white Excel CPU component in the same place”. The witness told the court that the safe was subsequently taken to EFCC office in Kano where key experts were invited to unlock it in the presence of Bitrus. “When the first panel was opened, we discovered foreign currencies. Specifically, US dollars and Pound Sterling. The unlocking process continued to the fourth panel which all contained money”. He told the court that the EFCC zonal head in Kano state engaged Bureau De Change operators that counted the money. “The money counted was $97, 72, 800.00, as well as £74, 000”. He said the money was immediately registered as exhibits, even as Bitrus volunteered a written statement. According to the witness, Yakubu, who was outside the country at that time, was later contacted through phone call and he appeared at EFCC office on February 8. He said that Yakubu, in his six-paged statement, admitted that he is the owner of the House and the money. The witness told the court that the recovered fund was boxed and sent to a strong room in the Central Bank of Nigeria for safe keeping. While being cross-examined by Yakubu’s lawyer, Mr. Ahmed Raji, SAN, the witness told the court that the EFCC is suspecting that the recovered fund is proceed of crime. Meantime, trial Justice Ahmed Mohammed, admitted the fire-proof-safe, the search warrant and Yakubu’s statement into evidence as exhibits A, B and C, even as the trial was adjourned till May 24. Yakubu who was GMD of the NNPC between 2012 and 2014, is answering to six-count charge preferred against him by the anti-graft agency. The court earlier granted him bail to the sum of N300million with two sureties in the like sum.